Donors want to feel like they’re a part of something big. That’s why creating some buzz around your Giving Tuesday campaign can generate big results. Giving Tuesday was created in 2012, as a way to kick off the year-end giving season. What began as a small movement inspired by giving back has become a worldwide phenomenon, with organizations participating from more than 40 countries around the world. Over the years, Neon nonprofits have come up with some excellent Giving Tuesday campaign ideas, and they’ve seen great results. To celebrate their past successes, we’re highlighting some of our favorite Giving Tuesday celebrations from members of the Neon community. Today, we’re featuring Lawrence Humane Society. 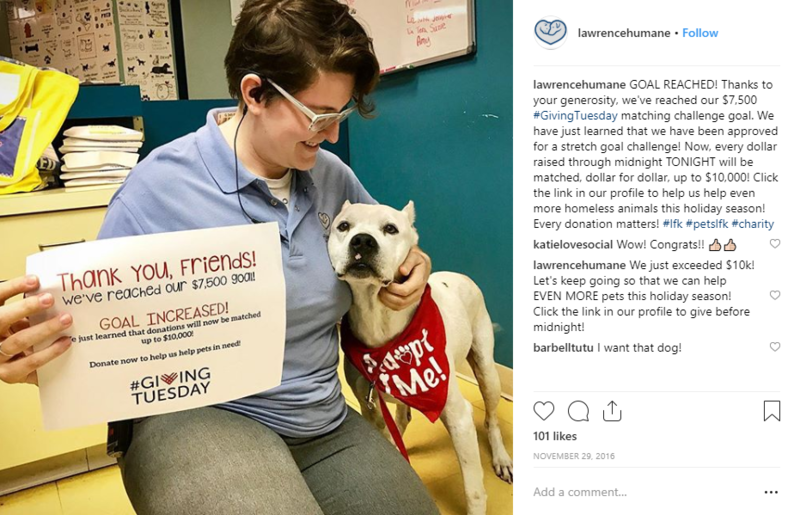 Lawrence Humane Society, an animal shelter located in Lawrence, Kansas, has been participating in Giving Tuesday since 2015. Each year, the response has been bigger and better. In 2016, Scheibe and the rest of her team took what they had learned from their first campaign, and built out a strategy around it — this time, with some extra help. The excitement paid off. Lawrence Humane received a match donor, who volunteered to match all donations up to $7,500. After meeting this goal early, a stretch goal of $10,000 in matched donations was approved. By the end of the event, Lawrence Humane had raised $24,000. Scheibe’s top advice for getting into Giving Tuesday? Understand how it can fold into your long-term goals, and don’t expect an overnight success. According to Scheibe, Lawrence Humane saw improved results when they made an entire day of it. They created a day-long communication strategy, complete with website updates, social media posts and a few emails. We are so pleased to hear about all of Lawrence Humane Society’s Giving Tuesday successes. Want to learn more about how you can use the same features they used to make over $24,000? Watch our free video demo! In 15 minutes, you can learn how our nonprofit CRM can help your organization make the maximum impact on Giving Tuesday and every day after that. Watch Our Video Demo Today!